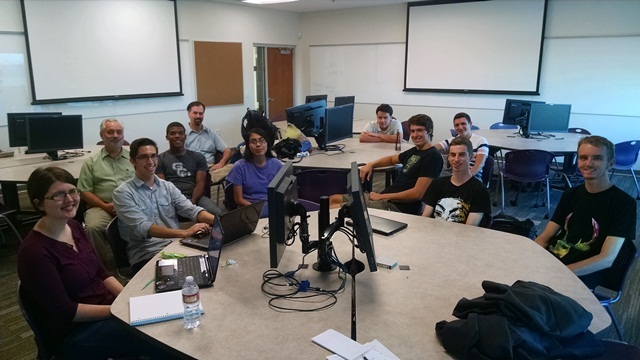 Grand Canyon University has a new student club pioneering an academic cloud computing lab that will be introduced in a key tech class this spring. The idea is to create a virtual environment for GCU students to engage in classroom projects, according to professors Luke Kanuchok and Dr. Steve Powelson, who are co-advising the new student club and helping to deploy the cloud lab for the College of Science, Engineering and Technology. GCU computer science and information technology students during an innovative Computing Club meeting at one of the new Building 16 classrooms, where many will be taking the CST-110 course. The student club, iC (short for “innovative Computing”), is composed mostly of freshmen since the computer science and information technology programs just launched this fall. Starting in January, CS/IT students will take their first tech course — the introductory CST-110 — and begin learning computer programs that they will work to master throughout their undergrad studies. Technology for the new cloud computing lab is provided by Brinkster, a local firm founded by GCU alumnus Jared Stauffer, who also serves on GCU President/CEO Brian Mueller’s advisory board for academic development around science, technology, engineering and mathematics — the fast-changing fields known as the STEM disciplines. Powelson, who built his entrepreneurial career around IT strategy and cloud computing, and Kanuchok, who joined GCU as lead faculty for computer science after more than eight years as a software engineer at Lockheed Martin, said they also envision the new academic cloud computing lab as a space where CSET students can collaborate with those from the Colangelo College of Business and others. Students in the iC club also will help coach their fellow students in CST-110 on the basics of the new cloud computing technology. “This will help them develop skillsets that they will need in the classroom and to be mentors to others in the classroom,” said Powelson, who is lead faculty for GCU’s IT programs. The new cloud computing lab is envisioned as a virtual forum where students can practice computer-programming skills through Minecraft simulations, big data analysis and other assignments. Organizers see the virtual lab as a way to support CSET classes rather than as a replacement for GCU’s current learning-management system. It’s a way to address students’ need to practice with programs such as Python C and other complex programming languages in the classroom but also for co-curricular project sharing designed to provide real-world business and industry-specific simulations. Students who organized the iC club with Kanuchok and Powelson said they were looking forward to testing the cloud computing lab in their CST-110 course now that they’ve nearly completed their first semester. GCU introduced its CS/IT degrees this fall. They include emphases on big data analytics, business entrepreneurship, game and simulation development, health-information technology, and technology innovation. Paul Rodriguez, president of the iC club, said he came to GCU to study IT and focus on health informatics for his future. But like most of his peers in the club, Rodriguez said he’s interested in so many different aspects of gaming, coding and data security, he and his iC mates see the club as a place where GCU students of all backgrounds can learn about CS/IT trends that impact their lives. As it evolves, students and advisers of the iC club could take a central roll in some of the technology collaborations that GCU has envisioned through its new academic programs. Rodriguez said club members already are kicking around lots of ideas. Stauffer, the Brinkster founder, earned his GCU bachelor’s degree in Christian studies in 1999 while he was in the midst of developing his tech company. He later completed his MBA at GCU and was named to the University’s Hall of Fame. With his ties to GCU, Stauffer said he looked forward to sharing his industry insight to help students prepare for their futures. In the CS/IT world, that future is ever-changing because of new technologies. But Stauffer added that the academic cloud computer technology Brinkster provided to GCU is the same type of enterprise cloud tool used by hundreds of small to midsize companies that contract with Brinkster. “It gives the students real-world experience,” said Stauffer, who already has hosted iC club students during their field trip to Brinkster’s downtown Phoenix office. “You can call it a simulation, but it’s actually the real public cloud that we sell (to companies). Contact Michael Ferraresi at michael.ferraresi@gcu.edu or 602-639-7030.